Hmmm, those look like cat prints in the mud. Too big for a house cat though. Wait a minute — is it even possible that wild cat walk the trails of the cloud forest? You betcha! Ranging in size from the wee Little Spotted Cat to the great and famous Jaguar, these shy and charismatic animals play an essential ecological role as the top predators in their environments. Given their secretive habits and need for large amounts of space, wild cats’ lives are known in much less detail compared to some of the other beguiling inhabitants of Monteverde, such as noisy and colourful birds. If you’re lucky though, your cloud forest adventure might include at least a glimpse of a clue that these majestic creatures still roam freely. In April 2014, outside of the Cloud Forest Reserves, a dead cat was found by the traffic police. The corpse was taken to the offices of the Santa Elena Cloud Forest Reserve. From here it was taken to the park and preserved on ice by the director, Maria Arias, who followed instructions by Costa Rica's leading taxidermist (Jorge Porras) from the Musuem of Natural Sciences, La Salle in San Jose, Costa Rica. As soon as he was able the taxidermist came up to Monteverde and step by step showed college students, park guides and workers of the Santa Elena reserve how to present the cat for display and educational purposes. 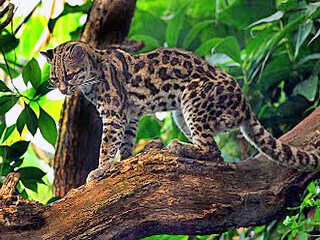 This cat is an Ocelot (Leoparduspardalis) also called a Manigordo.